Whether your material handling needs are large or small, Poweramp provides the quality equipment and dependable performance required. As a division of Systems, Inc, Poweramp dock equipment has been an industry leader in manufacturing and distributing material handling products and loading dock equipment worldwide since 1961. For 50 years, the Poweramp name has been synonymous with industry-leading loading dock equipment and safety product solutions. Through superior proprietary engineering capabilities, Poweramp provides customers with unmatched product quality. 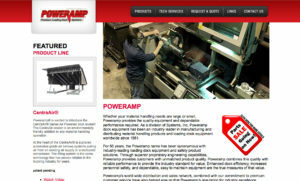 Poweramp combines this quality with reliable performance to provide the industry standard for value.